So my wonderful workplace has it’s own blog and I thought I’d share a piece I wrote for them on Madagascar. Check it out! 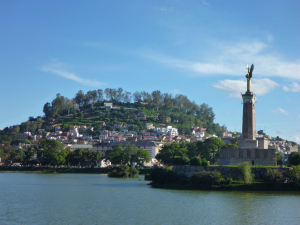 Welcome to Antananarivo… an unexpected gem and a place I was told I would dislike. But it has everything I love – interesting buildings, beautiful scenery, an intriguing history and locals with a sense of humour. It’s a place full of surprises; a built-up city with rice paddies right in the centre of town, traffic jams caused by an ox and cart, groups of young people dressed like they’re heading to their wedding and/or space… so many little things that put a smile on my face (lucky I brought some patience and a sense of adventure).